A slide show with transition immediately make the still pictures as dynamic as a movie. An excellent slideshow maker should provide users with various transition effects and let them feel free to apply the transitions to the slideshow. If there are a great number of slides in the project, it is necessary to have the option to randomize transitions for the slideshow. 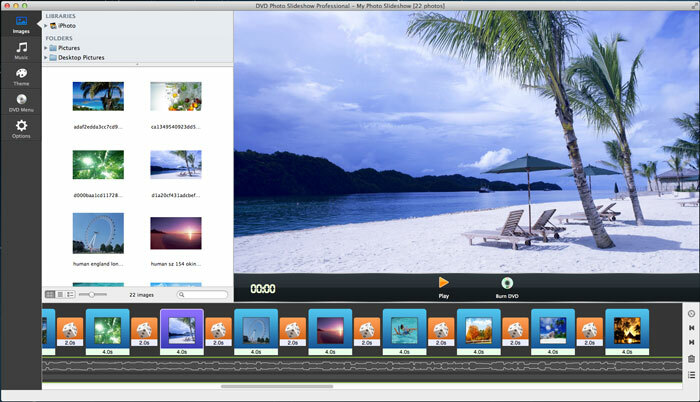 It is easy to create slideshow with transitions with DVD Photo Slideshow for Mac. 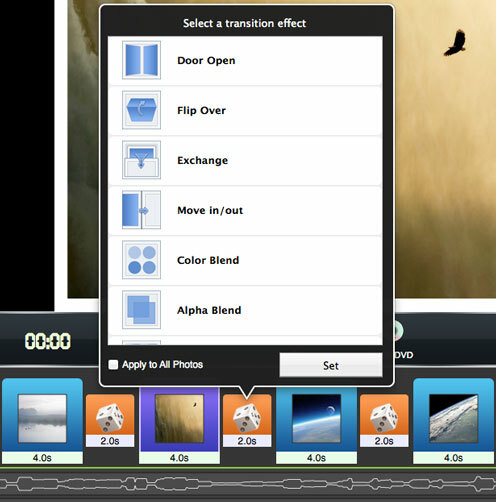 This Mac Slideshow Maker offers dozens of transition effects to choose from. By default, transitions are randomly applied to the slideshow after photos are added. Then you can also choose your favorite transition for the slide. When your slideshow is ready, you can output it as a video file or a DVD disc. Now let me show how you can create slideshow with transitions with DVD Photo Slideshow for Mac. While creating your slideshow, you can click the Play button to preview the real time effects. After all necessary settings, you can choose to encode your slideshow as a video files or burn your slideshow onto a DVD disc. Note: To learn more about how to set DVD menu, choose output format, add text, specify photo and transition duration, edit photo, set Pan & Zoom, and more, please refer to user guide of DVD Photo Slideshow for Mac.